Can the Honda CRV’s Gas Mileage Save You Money? For anyone who drives a car on a regular basis, the rise in gas prices presents a major concern. And if you drive long distances with any frequency, you know that gas prices, especially if you drive a gas guzzler, can really hurt your wallet in the long run. And while there are plenty of ways to mitigate this, one of the most basic ways is to drive a car with great gas mileage. When you picture gas savers, you might picture tiny cars or little lightweight hybrids. These are generally cars with good gas mileage, but they aren’t the only ones. If you have a family, need cargo space, or just want the option to roadtrip with a bunch of friends, the Honda CRV can be a money-saving tiny SUV. “SUV” and “good gas mileage” aren’t generally things you see in the same sentence, but the CRV is an exception to this often-accurate rule. According to FuelEconomy.gov,the 2015 CRV has a pretty impressive 28 mpg combined city and highway. City mpg averages out at 26, and highway mpg is about 33. Not bad for a five-seater with a decent amount of cargo space. So does this vehicle save you money? It depends on your needs. If you are single, don’t need a lot of space in a car, and just need good gas mileage to get you from point A to point B, you may be better off with a Smart Car or other tiny hybrid. If you are very interested in saving money on gas, you may want to look into a hybrid SUV. However, hybrid SUVs, while they can save you money in the gas department, actually cost you a good bit of money in other areas. IF you’ve even dipped your toe into the auto-sales pool that is the world of hybrid vehicles, then you know that your average hybrid will cost you a lot more than your average regular-fuel vehicle. You might think going used is a good idea, but used hybrids come with a catch (as do new hybrids). The definition of hybrid vehicle is a vehicle that runs on two kinds of fuel – battery and traditional gas. The battery, like any battery, wears down over time, and depending on the vehicle, replacing it can be incredibly expensive. If you want longevity in your vehicle, then going with a traditional small SUV like the Honda CRV is a good choice. Buying a non-hybrid also takes thousands off your initial purchase price, which is good if you don’t have spare thousands lying around (and realistically, who does?). 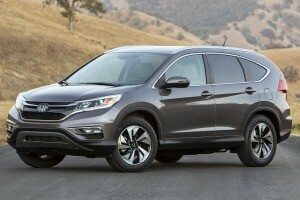 Let’s compare the CRV to a couple of other small, regular-fuel SUVs. One popular alternative is the Acura MDX. This is marketed as a luxury vehicle, but how does it measure up in terms of saving money? Well, the MDX has a combined city/highway mpg of 21, a highway mpg of 27, and a city mpg of only 18. It may let you travel in luxury, but you’ll be paying for it by the mile. Another popular vehicle that many consider is the Toyota Rav4 (or Toyota’s answer to Honda’s CRV). While the Rav4 gets better mileage than the Acura MDX, it still isn’t on par with the CRV. This vehicle gets a combined city/highway 26 mpg, 23 mpg city, and 30 mpg highway. It’s close, but those few miles per gallon can add up over the years, ultimately costing you more over the life of the vehicle. The Honda CRV can really save you money when it comes to gas mileage – so when you want a small SUV with plenty of space (and one that won’t break your wallet), go with the Honda CRV.